This is part of the book Category Theory for Programmers. The previous instalment was Category: The Essence of Composition. See the Table of Contents. The category of types and functions plays an important role in programming, so let’s talk about what types are and why we need them. There seems to be some controversy about the advantages of static vs. dynamic and strong vs. weak typing. Let me illustrate these choices with a thought experiment. 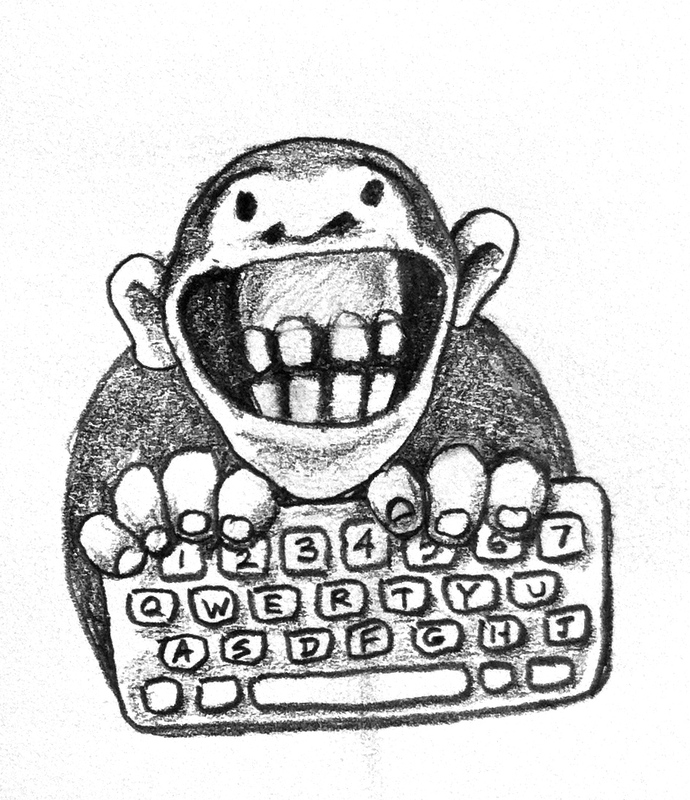 Imagine millions of monkeys at computer keyboards happily hitting random keys, producing programs, compiling, and running them. With machine language, any combination of bytes produced by monkeys would be accepted and run. But with higher level languages, we do appreciate the fact that a compiler is able to detect lexical and grammatical errors. Lots of monkeys will go without bananas, but the remaining programs will have a better chance of being useful. Type checking provides yet another barrier against nonsensical programs. Moreover, whereas in a dynamically typed language, type mismatches would be discovered at runtime, in strongly typed statically checked languages type mismatches are discovered at compile time, eliminating lots of incorrect programs before they have a chance to run. So the question is, do we want to make monkeys happy, or do we want to produce correct programs? The usual goal in the typing monkeys thought experiment is the production of the complete works of Shakespeare. Having a spell checker and a grammar checker in the loop would drastically increase the odds. The analog of a type checker would go even further by making sure that, once Romeo is declared a human being, he doesn’t sprout leaves or trap photons in his powerful gravitational field. Category theory is about composing arrows. But not any two arrows can be composed. The target object of one arrow must be the same as the source source object of the next arrow. In programming we pass the results on one function to another. The program will not work if the target function is not able to correctly interpret the data produced by the source function. The two ends must fit for the composition to work. The stronger the type system of the language, the better this match can be described and mechanically verified. The only serious argument I hear against strong static type checking is that it might eliminate some programs that are semantically correct. In practice, this happens extremely rarely and, in any case, every language provides some kind of a backdoor to bypass the type system when that’s really necessary. Even Haskell has unsafeCoerce. But such devices should be used judiciously. Franz Kafka’s character, Gregor Samsa, breaks the type system when he metamorphoses into a giant bug, and we all know how it ends. Another argument I hear a lot is that dealing with types imposes too much burden on the programmer. I could sympathize with this sentiment after having to write a few declarations of iterators in C++ myself, except that there is a technology called type inference that lets the compiler deduce most of the types from the context in which they are used. In C++, you can now declare a variable auto and let the compiler figure out its type. In Haskell, except on rare occasions, type annotations are purely optional. Programmers tend to use them anyway, because they can tell a lot about the semantics of code, and they make compilation errors easier to understand. It’s a common practice in Haskell to start a project by designing the types. Later, type annotations drive the implementation and become compiler-enforced comments. Strong static typing is often used as an excuse for not testing the code. You may sometimes hear Haskell programmers saying, “If it compiles, it must be correct.” Of course, there is no guarantee that a type-correct program is correct in the sense of producing the right output. The result of this cavalier attitude is that in several studies Haskell didn’t come as strongly ahead of the pack in code quality as one would expect. It seems that, in the commercial setting, the pressure to fix bugs is applied only up to a certain quality level, which has everything to do with the economics of software development and the tolerance of the end user, and very little to do with the programming language or methodology. A better criterion would be to measure how many projects fall behind schedule or are delivered with drastically reduced functionality. As for the argument that unit testing can replace strong typing, consider the common refactoring practice in strongly typed languages: changing the type of an argument of a particular function. In a strongly typed language, it’s enough to modify the declaration of that function and then fix all the build breaks. In a weakly typed language, the fact that a function now expects different data cannot be propagated to call sites. Unit testing may catch some of the mismatches, but testing is almost always a probabilistic rather than a deterministic process. Testing is a poor substitute for proof. The simplest intuition for types is that they are sets of values. The type Bool (remember, concrete types start with a capital letter in Haskell) is a two-element set of True and False. Type Char is a set of all Unicode characters like 'a' or 'ą'. Sets can be finite or infinite. The type of String, which is a synonym for a list of Char, is an example of an infinite set. we are saying that it’s an element of the set of integers. Integer in Haskell is an infinite set, and it can be used to do arbitrary precision arithmetic. There is also a finite-set Int that corresponds to machine type, just like the C++ int. There are some subtleties that make this identification of types and sets tricky. There are problems with polymorphic functions that involve circular definitions, and with the fact that you can’t have a set of all sets; but as I promised, I won’t be a stickler for math. The great thing is that there is a category of sets, which is called Set, and we’ll just work with it. In Set, objects are sets and morphisms (arrows) are functions. Set is a very special category, because we can actually peek inside its objects and get a lot of intuitions from doing that. For instance, we know that an empty set has no elements. We know that there are special one-element sets. We know that functions map elements of one set to elements of another set. They can map two elements to one, but not one element to two. We know that an identity function maps each element of a set to itself, and so on. The plan is to gradually forget all this information and instead express all those notions in purely categorical terms, that is in terms of objects and arrows. may return True, False, or _|_; the latter meaning that it would never terminate. (without the x) because the bottom is also a member of the type Bool->Bool. Functions that may return bottom are called partial, as opposed to total functions, which return valid results for every possible argument. Because of the bottom, you’ll see the category of Haskell types and functions referred to as Hask rather than Set. From the theoretical point of view, this is the source of never-ending complications, so at this point I will use my butcher’s knife and terminate this line of reasoning. From the pragmatic point of view, it’s okay to ignore non-terminating functions and bottoms, and treat Hask as bona fide Set (see Bibliography at the end). Why Do We Need a Mathematical Model? As a programmer you are intimately familiar with the syntax and grammar of your programming language. These aspects of the language are usually described using formal notation at the very beginning of the language spec. But the meaning, or semantics, of the language is much harder to describe; it takes many more pages, is rarely formal enough, and almost never complete. Hence the never ending discussions among language lawyers, and a whole cottage industry of books dedicated to the exegesis of the finer points of language standards. The problem is that it’s very hard to prove things about programs using operational semantics. To show a property of a program you essentially have to “run it” through the idealized interpreter. It doesn’t matter that programmers never perform formal proofs of correctness. We always “think” that we write correct programs. Nobody sits at the keyboard saying, “Oh, I’ll just throw a few lines of code and see what happens.” We think that the code we write will perform certain actions that will produce desired results. We are usually quite surprised when it doesn’t. That means we do reason about programs we write, and we usually do it by running an interpreter in our heads. It’s just really hard to keep track of all the variables. Computers are good at running programs — humans are not! If we were, we wouldn’t need computers. But there is an alternative. It’s called denotational semantics and it’s based on math. In denotational semantics every programing construct is given its mathematical interpretation. With that, if you want to prove a property of a program, you just prove a mathematical theorem. You might think that theorem proving is hard, but the fact is that we humans have been building up mathematical methods for thousands of years, so there is a wealth of accumulated knowledge to tap into. Also, as compared to the kind of theorems that professional mathematicians prove, the problems that we encounter in programming are usually quite simple, if not trivial. Okay, I’ll be the first to admit that this was a cheap shot! A factorial function has an obvious mathematical denotation. An astute reader might ask: What’s the mathematical model for reading a character from the keyboard or sending a packet across the network? For the longest time that would have been an awkward question leading to a rather convoluted explanation. It seemed like denotational semantics wasn’t the best fit for a considerable number of important tasks that were essential for writing useful programs, and which could be easily tackled by operational semantics. The breakthrough came from category theory. Eugenio Moggi discovered that computational effect can be mapped to monads. This turned out to be an important observation that not only gave denotational semantics a new lease on life and made pure functional programs more usable, but also shed new light on traditional programming. I’ll talk about monads later, when we develop more categorical tools. One of the important advantages of having a mathematical model for programming is that it’s possible to perform formal proofs of correctness of software. This might not seem so important when you’re writing consumer software, but there are areas of programming where the price of failure may be exorbitant, or where human life is at stake. But even when writing web applications for the health system, you may appreciate the thought that functions and algorithms from the Haskell standard library come with proofs of correctness. The things we call functions in C++ or any other imperative language, are not the same things mathematicians call functions. A mathematical function is just a mapping of values to values. We can implement a mathematical function in a programming language: Such a function, given an input value will calculate the output value. A function to produce a square of a number will probably multiply the input value by itself. It will do it every time it’s called, and it’s guaranteed to produce the same output every time it’s called with the same input. The square of a number doesn’t change with the phases of the Moon. Also, calculating the square of a number should not have a side effect of dispensing a tasty treat for your dog. A “function” that does that cannot be easily modelled as a mathematical function. In programming languages, functions that always produce the same result given the same input and have no side effects are called pure functions. In a pure functional language like Haskell all functions are pure. Because of that, it’s easier to give these languages denotational semantics and model them using category theory. As for other languages, it’s always possible to restrict yourself to a pure subset, or reason about side effects separately. Later we’ll see how monads let us model all kinds of effects using only pure functions. So we really don’t lose anything by restricting ourselves to mathematical functions. Notice that every function of unit is equivalent to picking a single element from the target type (here, picking the Integer 44). In fact you could think of f44 as a different representation for the number 44. This is an example of how we can replace explicit mention of elements of a set by talking about functions (arrows) instead. Functions from unit to any type A are in one-to-one correspondence with the elements of that set A. What about functions with the void return type, or, in Haskell, with the unit return type? In C++ such functions are used for side effects, but we know that these are not real functions in the mathematical sense of the word. A pure function that returns unit does nothing: it discards its argument. Notice that the implementation of this function not only doesn’t depend on the value passed to it, but it doesn’t even depend on the type of the argument. but C++ enum is secretly an integer. The C++11 “enum class” could have been used instead, but then you would have to qualify its values with the class name, as in bool::true and bool::false, not to mention having to include the appropriate header in every file that uses it. Pure functions from Bool just pick two values from the target type, one corresponding to True and another to False. Functions to Bool are called predicates. For instance, the Haskell library Data.Char is full of predicates like isAlpha or isDigit. In C++ there is a similar library that defines, among others, isalpha and isdigit, but these return an int rather than a Boolean. The actual predicates are defined in std::ctype and have the form ctype::is(alpha, c), ctype::is(digit, c), etc. Define a higher-order function (or a function object) memoize in your favorite language. This function takes a pure function f as an argument and returns a function that behaves almost exactly like f, except that it only calls the original function once for every argument, stores the result internally, and subsequently returns this stored result every time it’s called with the same argument. You can tell the memoized function from the original by watching its performance. For instance, try to memoize a function that takes a long time to evaluate. You’ll have to wait for the result the first time you call it, but on subsequent calls, with the same argument, you should get the result immediately. Try to memoize a function from your standard library that you normally use to produce random numbers. Does it work? Most random number generators can be initialized with a seed. Implement a function that takes a seed, calls the random number generator with that seed, and returns the result. Memoize that function. Does it work? Which of these C++ functions are pure? Try to memoize them and observe what happens when you call them multiple times: memoized and not. The factorial function from the example in the text. How many different functions are there from Bool to Bool? Can you implement them all? Draw a picture of a category whose only objects are the types Void, () (unit), and Bool; with arrows corresponding to all possible functions between these types. Label the arrows with the names of the functions. Nils Anders Danielsson, John Hughes, Patrik Jansson, Jeremy Gibbons, Fast and Loose Reasoning is Morally Correct. This paper provides justification for ignoring bottoms in most contexts. I’m still reading along, but just a thought: do you think it would be helpful to provide references for further reading? For example, to explain Goedel? That way, even if you don’t want excessive “mathiness” to permeate the writing, readers would have an idea of where to look for more. Very enjoyable so far! @William: Twitter works fine. I’ll see it if you mention @BartoszMilewski. So a point of precision here: I think you confuse denotational and categorical semantics a bit. I just checked back at the Moggi paper “Notions of Computation and Monads” and indeed he constrasts the approach there, which he describes as categorical semantics, to all three of denotational, logical, and operational accounts. Also, denotational semantics prior to Moggi already could deal with effects, just not as pleasantly — indeed, the discipline (from the Strachey standpoint, not the Scott one) was motivated by trying to understand languages like C, and it was in fact in Strachey’s work that the idea of lvals was first introduced! For similar reasons, this statement is false: “In a pure functional language like Haskell all functions are pure. Because of that, it’s possible to give these languages denotational semantics and model them using category theory.” The falsehood is in the fact that we can also give imperative languages denotational semantics and model them using category theory (or rather, we model them using denotational semantics with borrowings from category theory — genuine categorical semantics get scary fast and aren’t used for ‘real sized’ languages as far as I know). Here, for example, is a paper on the denotational semantics of ANSI C (as implemented, of course in Haskell :-P) http://www.softlab.ntua.gr/~nickie/Papers/papaspyrou-2001-dsac.pdf. I think that densem and cat theory (which are not the same — traditional densem is set theoretic) must be motivated not as the only way to do things, but as ways with certain advantages. Here is a perhaps clearer way to argue things: denotational / categorical semantics can be much easier to reason about than operational ones. however, the link between denotational / categorical semantics and imperative languages is typically harder to establish than the link between imperative languages and their operational semantics. If we accept that we have a better way to talk about what programs “mean” then perhaps we should have languages that allow us to represent things closer to that way in the first place, and we should attempt to internalize their constructs (such as monadic effects) directly into those languages as much as possible. I think that the debate around static/dynamic weak/strong typing debate misses the point. Explaining what typed and functions and what their advantages are won’t change a thing. People use dynamic languages because it is simple and faster to get things running. Why is that? My hypothesis is that is is in big part because of culture. The Haskell world fosters a culture of complexity even for minor tasks. Then you have the fact that Haskell is a relatively simple language by itself, but every library developer feels the need to bring in his own set of Language extensions. Hence you end up having a good bunch of Haskell variants to study. This complexity culture partially explains for me why people will prefer Ruby, Clojure, Python or even Java to Haskell (and Scala to a lesser extent). PS: For now I am a happy Lisper (with typed clojure and its gradual typing). I’m really appreciating ocaml and F# these days and I’m considering pushing them at work. I abandoned the idea of pushing Haskell because I could only see a world of pain for my coworkers. @sclv: I’m glad you are keeping me on my toes ;-). I have modified the offending sentence replacing “possible” with “easier” (that’s the great thing about blogs: you can improve on them). @johann: I sympathize with your arguments, but what you’re complaining about is the prevailing practice in the Haskell community, which will hopefully improve with time, not the principle of strong typing. I’ve seen people throwing together shell scripts in Haskell in no time, using Haskell’s type inference to avoid any explicit typing. It feels like programming in a dynamic language, except when you make a mistake. 1) weak = dynamically typed, strong = statically typed. 4) Weak = relatively limited static type systems (e.g. all dynamically typed languages, but also C and Pascal), Strong = relatively rich type systems (e.g. Haskell and Scala). I guess by that definition Java and C# would be medium strong and Agda would be ultra strong. Or something. I read through this post and suspect you mean at least #4 but also maybe #5. But it’s not clear. Thank you for an interesting article and a really interesting blog. The big problem I have with statically typed languages that I have experience with (mostly C and C++) is that they are inherently bad at handling dynamic data. That is data where the type of the data is not necessarily known beforehand. And I find that a whole lot of problems go into that domain. for examples, I’m not sure of an equivalent of this in haskell although implementations may well exist. Type System applies rules to source code that are not covered by language (context free) grammar. In other words, Type system looks like replacement for extensible and context sensitive grammar that covers user defined types and code. Static program analysis is about applying (context sensitive) rules to source code, like grammar. Another attempt of enforcing rules is C# using (resource) statement. Resources are created, used and disposed in ruled order, also like grammar. We need tools that at compile time can check the rules about how to use resources or order of using library functions / object creating-using-disposal / assigning or checking nullable types before use / memory allocation-use-disposal etc. @sclv This is basically an aside, but the idea that denotational semantics means “interpret in a category” has become a pretty common one. For example, Carvhalo in “Execution Time of λ-Terms via Denotational Semantics and Intersection Types” says “The fundamental idea of denotational semantics is that types should be interpreted as objects of a category C and terms should be interpreted as arrows in C in such a way that if a term t reduces to a term t′, then they are interpreted by the same arrow.” I am sure if I tried I could dig up other people saying essentially the same thing. I don’t know if I agree with this view: different people mean different things when they say “denotational semantics”–often what is meant is something like “Scott semantics.” In the context of logic, “denotational semantics” usually is differentiated from other kinds of models in that it models proofs and not just provability. That said, there is some strength to the “denotational is categorical view”–it gives a particular research direction for coming up with models that looks something like 1. figure what you need in the category to model your language 2. come up with a category with those features. This is explicitly the research direction taken by people like Lars Birkedal (or at least I have heard him describe his work that way) and seems to be what is going on with people like Samson Abramsky. So, although it might not be a universal perspective, it seems it would be be hard to argue it is a bad one. Anyways, as I said this is all an aside. How much you emphasize category theory vs other approaches is a matter of taste. @philipjf. My point was not that people don’t use terms loosely to mean many things. It is that the historic account given is misleading, and particularly if one turns to Moggi’s paper we see that he explains he is doing categorical semantics in contrast to denotational semantics! As discussed above, even sans monads, denotational semantics could tackle this stuff. So perhaps the following. And similarly I would suggest “and made pure functional programs much more usable”. After all, we had a usable, if awkward IO story for Haskell even prior to monads. Much of Plotkin’s work on effects has been, in a sense, suggesting an alternate history in which Monads where not taken up so fulsomely, and asking what avenues we may have continued to go down instead. Such avenues, of course, end up being also very categorical, but in a somewhat different way. @sclv: All right, is it better now? Well… I actually do sometimes. Usually it’s when the interface I am using is documented poorly, whether “poorly” means “underdocumented” or “overcomplicated”, or even both, as the case with pretty much any “asynchronous” API. So I just imagine some sort of idealized behaviour, with sane invariants and pre-/post-conditions, write a toy implementation and then, amazedly, watch how destroyed objects keep sending events (with the sender being a null pointer at best), how EVENT_CONNECTION_DROPPED arrives before EVENT_MORE_DATA_ARRIVED, how some events are never reported/passed to me even though they clearly happen, and all such nonsense. After this I indeed start “just throwing lines of code and see what happens”, to learn crucial things that were left out from the documentation. Denotational semantics is lovely and exciting, but most people actually prefer axiomatic semantics when trying to reason about correctness: I’d argue that the reasoning along the lines “those variables are guaranteed to have such and such values when the execution hits this point of code, so calling this routine with such and such parameters can’t cause any surprises, and after it returns, the program state will satisfy that and that condition” is not an application of operational semantics, and definitely not of denotational semantics. Surely, picking some particular mathematical objects will provide us with exactly the axioms we need to infer conclusions that are of interest to us but after we have realised that those axioms are the ones we need, we can we work just with them, without the “interpretation” in terms of those objects. @Joker_vD: What you are calling axioms are actually theorems and they can be derived from either version of semantics. An example of axiomatic semantics is the description of C++ weak atomics — one of the most unapproachable areas of language definition. As far as I know (and I talked to Hans Boehm about it), there is no operational model for weak atomics, just a set of axioms about visibility of writes. Yes, the axioms/properties/theorems/invariants/whatchamacallit definitely can be derived from operational or denotational semantics. But axiomatic semantics starts with them, without any “interpretation” attached, be it a state machine in case of operational semantics or a domain/category in case of denotational semantics. If we’re talking about “portable races” aka weak atomics, while I’d agree that there probably cannot be an operational semantics equivalent to the axiomatic semantics, I’d say there are many operational semantics satisfying the axiomatic semantics: x86+RAM and ARM+RAM can be described as state machines, albeit very cumbersome ones (which is troubling because reasoning about state machines such cumbersome is not easier than formulating theorems about properties that you actually want). So that’s the difference between the axiomatic and denotational approach, at least as I understand it: instead of looking for a bag of mathematical objects that reflects the desired properties of our programming language constructs, reason about those properties directly; don’t search for another model/interpretation of the logic theory that is the meaning of the programming language, work with the logic theory itself. The axiomatic semantics is that theory, the operational semantics is a human-friendly model of that theory, and the denotational semantics is a mathematician-friendly model of it. so if-like constructs would work. @monnoroch: Yes, I’ve seen your translations. Thank you for popularizing my work in Russia. Implicit conversions between data types, bool and int in this case, are a source of some of the most insidious bugs. A well-written C++ program should work independently of how true and false are encoded. That’s why I deliberately started with true. Of course, this was just a hypothetical definition, since bool, true, and false are reserved keywords in C++. I’m not sure if this was an intentional simplification or not (after all, this (great!) series is about category theory, not the Curry-Howard isomorphism), but where you’ve written, “the function absurd is the statement that from falsity follows anything,” I believe it should read, “the function absurd is a proof of the statement that from false follows anything;” it’s the (polymorphic) type of absurd which corresponds to that statement. @sj: I was being vague because this is only true in a vague, hand-waving sense, considering the problems with the bottom in Haskell. The type of the function absurd corresponds to a preposition, the implementation would be the proof, and I didn’t provide the implementation, so I couldn’t claim the proof. I looked at Edward Kmett’s clever hack in Data.Void but I don’t think it would make it any clearer. Exercise #6 raises some questions in my beginner mind. There are two functions of the type () -> Bool. Are those distinct morphisms? It seems so, because I’m asked to label the morphisms, but my intuition tells me that they’re identical? @Uglemat: These two functions are not identical because they produce different results for the same input. Your intuition is probably telling you that flipping True and False (the negate function) is an isomorphism, which is true. But that doesn’t mean that the two functions are the same. @Milewski Actually my thinking was that hom(A, B) could have maximum one element. Because wouldn’t more than one be superfluous? Because what more information is contained in a morphism than the two objects? Should the concrete “behavior” of a morphism be taken as a part of its information? I guess what I’m saying is that I don’t understand what a morphism is. When you do type-checking, you wouldn’t distinguish between two morphisms with the same start and target because both are equivalent in the world of types, where concrete implementation is “hidden”, maybe that’s what caused me to think the stuff above. @Uglemat: There are two points of view. When you’re looking at an abstract category, you’re not supposed to “understand” what a morphism is. You just say there are two morphisms between these two objects, and that’s that. The structure of the category lies in how many morphisms there are between any two objects and how they compose. But here we are trying to build a category by mimicking the structure of a programming language. So we look at the language, its types and its functions, and build a category that corresponds to it. There is a type called () and a type called Bool. They will correspond to two objects in our category. Then there are two functions from () to Bool. They will give rise to two morphisms between the two objects. Abstracting means forgetting about the implementation. In the category, we no longer remember why the two morphisms were supposed to be different — they just are. The structure of the category lies in how many morphisms there are between any two objects and how they compose. Ok, that makes sense. You’d have to represent a morphism with a 3-tuple like (from, to, morphism-id) though if hom-set returns an actual set (if I understand set theory correctly). Since hom-set doesn’t need to return an actual set (as morphism@wikipedia tells me) maybe that’s a different way of solving it (if “not set” can be taken to mean a list). Thanks for clearing this up! I try to use the word hom-set to denote a set of morphisms. What Wikipedia says is that some people stretch the notion of hom-set to mean something more than a set (I try to use hom-object in that case). But when they say that hom-set is not a set, they mean it’s a class — something that can be bigger than a set. Yes, there are things bigger than sets. For instance, a collection of all sets is not a set. Fortunately, as programmers, we don’t have to worry about such things. Maybe you mentioned it somewhere in your posts and I just overlooked it, but Hask = Set + | implies that category Set consists of countable sets only. Is this simplification made only here or the category theory doesn’t work with uncountable sets either? Does it matter at all, as I get the feeling that many things are irrelevant in this field? Set is a category of all sets, countable and uncountable. Any idea how to get rid of explicit Arg type parameter? Is this right? Should there be two arrows from unit to bool? I think there are some template tricks using traits that could eliminate the need for the explicit type parameter Arg. Yes, there should be two arrows from unit () to bool (but only one from Void). And don’t forget the identity arrows. Should there be two morphisms Bool->Void and ()->Void? We can define such functions, but can’t call them — same as “absurd”, right? And should there be a “not” morphism Bool->Bool? If yes, than it will look like “identity” but won’t satisfy laws of “identity”. And if no, than why? There is a function “not” and all functions should be in category in form of morphism, right? May I know what this sentence means? Any example perhaps? I’ve been trying to understand monad and I heard that it’s heavily related to category theory. Really appreciate for the effort you’re putting in explaining it very extensively here. @ rpominov: How would you define a function Bool->Void? What would it return when called with True? I think I understand now. I was confused with what “define” means. I thought it meant to “define” type signature of a function. I just did’t realize that for Void->Bool we can define not only signature, but a function body as well, and still won’t be able to call it. While for Bool->Void we can’t define a function body, so there can’t be such morphism. And for not I just did’t realize that in a category can be a morphisms from A to A, that isn’t the identity morphisms. You’ll never be able to call it. But that’s a different story. You can declare idVoid :: Void -> Void and define it idVoid x = x in Haskell but You’ll never be able to call it. It was more difficult to define Void to anything other than Void or Unit. I could not map Void to Boolean. My consideration suggests that there should be only one such function. But which one? This table also illustrates chapter 5. We clearly see that ⊥ suits the terminal object definition since there is always 1 function of type a → ⊥ and 0 functions of type ⊥ → a except ⊥ → ⊥, which has undefined number of functions. We also see that the unit () has always 1 map to it from any type, making it ideal terminal object. Yet, it also maps to every value in your type system, as you say in this chapter, which makes it not that terminal. @Valentin: By convention, 0^0 is assumed to be 1, so you do get correct numbers in all cases. I wouldn’t use the symbol ⊥ for the initial object, because it has a meaning in Haskell as a non-terminating computation. The presence of non-termination complicates things a lot, and I want to avoid it. The fact that () maps to any other object (except Void) doesn’t interfere with it being terminal. but you can easily convince yourself that it’s the same function. Or, if you like proof by contradiction, try to show that vtob is different from vtob’. You would have to find an argument for which they produce different values. Good luck finding such argument! “Vacuously equal” is brilliant. Indeed, it seems to be a generalization of vacuous truth, ∀x∈A:Q(x) where Q is not limited to bi-value predicate. I am sure that everybody will agree that this is utterly breathtaking. But I am still would like to know why 0^0=1 is “a correct number”. We should have all 1’s in the first row of the table and all zeroes in the first column. There is a certain conflict at their intersection, in the first corner cell, if it must be set to 0 or 1. It is surprising that category theory argues for correct number 0^0 = 1. It paradoxically says that can produce Void given a Void, despite we cannot produce anything else, given a Void with the argument “nobody can give us a void”. I kind of feel like thinking of types as sets only is somehow incomplete. Isn’t it also necessary to equip your sets with composition laws to completely describe them? For example, in the boolean type example, it is clear that it is a different type from say, the equivalence classes of integers modulo 2. Since both sets are of cardinality 2, what differenciates them is their composition laws. In the previous section I explained that composition is the essence of every category. In the category of sets, this would be the composition of functions between these sets. Having said that, sets of the same cardinality are isomoprhic, which means they can be substituted for each other. If you have an algoritm implemented in terms of Booleans, you can write an equivalent algorithm in terms of integers modulo 2. The only difference between isomorphic types is that some of them might lead to more efficient implementations, which is something outside of type theory. Ok, I understand now. While reading your articles, I keep forgetting we are talking about sets, not groups or other kind of structures equiped with composition laws. I made the same error in the next section: I didn’t understand why it was saying that “adders” where morphisms because clearly they where not mapping identity at the left to identity at the right. But I realise now that there is no identity element in sets and morphisms between sets are functions so it make sense after all. It is unnatural for me to think in these terms because I am not used to it. I keep viewing this through the prism of my prior group algebra exposure. Thanks for blog posts. Its been very enjoyable so far. I’ve seen many memoize functions for single parameter functions on integers. Here is my attempt at memoizing variadic functions in ECMAScript® 2015.
i feel like only () -> () is possible to implement, everything else is either impossible or absurd? What about two possible functions ()->Bool, for instance? I would like to mention that Enzo’s solution is not complete. Some morphisms of type Bool -> Bool are missing. Who is Enzo? And what solution are you talking about? It’s obvious that ∀v∈Void => vtob v = True ≠ False = vtob’ v. So vtob = vtob’ can only be satisfied if there are no v’s (otherwise, we claim vtob v = True = False = vtob’ v, which is fallacious). Since v∈Void and Void is empty, the condition that there are no v’s is satisfied. Therefore, it is indeed true that vtob = vtob’. This article in wikipedia may help. Which studies are you referring to? If it’s not too much trouble, could you provide the references? A Comparative Study of Programming Languages in Rosetta Code. They contain references to other studies. A good resource is Why Haskell Matters. With regards to Bool -> Void and () -> Void, wouldn’t following be a proper morphism? As Hask includes bottom, is it correct to say that this function is a morphism? It’s a tricky question. That’s why I keep hedging my statements about Haskell by saying “ignoring bottoms.” Some people, like Andrei Bauer or Robert Harper, even doubt whether Hask is a real category. There are two functions from Void to Bool, right? But despite appearances, these two formulas give you the same function. For any value of the argument x, they produce the same result. Remember, x must be an element of the empty set! Hi Bartosz, thanks for the great series of articles. I’ve just started and I am amazed by how simple things appear after your explanation. I am just curious about point 5 from the challenges. What I came up with is 4 distinct functions of Bool -> Bool signature. But that seems the same as false. So based on the above my intuition tells my that there are 4 distinct Bool -> Bool functions. Am I right ? @Łukasz: Later you’ll see that these functions can be represented as BoolBool, or 22, which indeed gives 4. Hi, great to read about a seemingly esoteric subject in a context I’m very familiar with – programming ! One point in this text… you mention “A mathematical function is just a mapping of values to values.” Might be worth mentioning that mathematical functions are single-valued mappings and not multi-valued mappings, i.e. a single input cannot go to two or more different outputs. That’s because a mathematical function is just an abstraction, and a programming language function is a concrete implementation of a mathematical function. Is that correct? Here is my scala version for memoize function with function argument and type argument curried. I am still baffled with the idea if I could memoize it without specifying any type arguments and with only 1 function as an argument as in def g(f: A=>A): A=>A. Because I do not have any type argument to cache against; the simple stupid solution being caching all the possible values for the type before any call to function. The great thing is that there is a category of sets, which is called Set, and we’ll just work with it. In Set, objects are sets and morphisms (arrows) are functions. Wouldn’t a C++ version of Void looks like this? This type is an empty set. It stores no values and no objects (variables) of this type can be created. Here is an example of memoize using Haskell and the StateT monad transformer! You’ll see the first two calls to fibMemoized (in the mapM function in main) are slow while the last one finishes immediately. in print $ (take 30 sh) ++ ".. excluding " ++ (show $ length sh - 30) ++ " digits"
In our meeting in Amsterdam, the biggest confustion surrounding chapter 2 was the discussion about Hask and bottom. In the current organization of the material, a lot of time is spent on the exception (Hask), and only very little time on the rule (Set). This had as a result in our meeting that the basic understanding of Set (objects are sets, morphisms are functions) was not in everyone’s head. The specific category, category of sets, called Set, describes its sets and total functions. A set is more generally an object and a total function more generally a morphism. Types describe sets of specific values. In CT; types = sets, values = elements. The sets (objects) in a Set (category of sets) can be composed of different sets. I’m not sure what you mean by: The sets (objects) in a Set (category of sets) can be composed of different sets. Would this make more sense and be correct? The sets (objects) in a Set (category of sets) are composed of different types of sets such as empty set and singleton set and others (of which I’m not sure yet). Is it correct to say that each set in a Set category can be composed of different types of sets such as empty and singleton? (maybe this is further detail that will become clearer later) I’m very new to describing and thinking in terms of CT so apologies in advance and for any stupid questions (!) Also, thank you for inspiring me to look at CT 🙂 and apologies for the delay, google didn’t notify me (fixed). How many arrows for the same pair of objects (A,B) can we have in a category? I’m struggling with for years, looks like different sources contradict each other. Let’s consider just arrows Bool->Bool. I can imagine 4 of them: id, not, false (const returning false), true. They are different by definition  and common sense. Taking  into account, the picture drawn is NOT a category, which contradicts the excersise statement. The answer to you question is: there can be as many arrows between two objects as you want, they form a set called the hom-set. The statement you are quoting “individual morphisms can never equal each other” is very confusing. It essentially says that if two morphisms are different then they can’t be equal. Just ignore it. I’m having trouble gaining intuition about the singleton set. The empty set is clear, because it’s a concrete concept that’s easy to visualize, but the singleton set is this set containing some strange value that “just is”. Is it correct to think of the singleton set as the set containing just the empty set? This seems to correspond to the syntax “()” and that the empty set can always be constructed at will. Or should I just accept that this is a magic value of which there is only one? The trouble with intuition is that we all have different concept of sets, based on examples we’ve encountered. You probably don’t have a problem with the Boolean set, which contains just two elements. When you want to call a function that takes a Bool, you have to make a decision: pass it True or False? Where do you get these values from? It’s the same with (), except that you don’t have to decide.